Strutting straight from the feverish nightmare of a tabloid newspaper editor comes this new, controversial and immediately very popular website. Thieves Like Us (or TLU as it likes to refer to itself) is a criminal's dream. Burglars (and potential burglars) have to only enter a few questions about their location and thieving skillset to be presented with a selection of properties that match their ability level and desires. 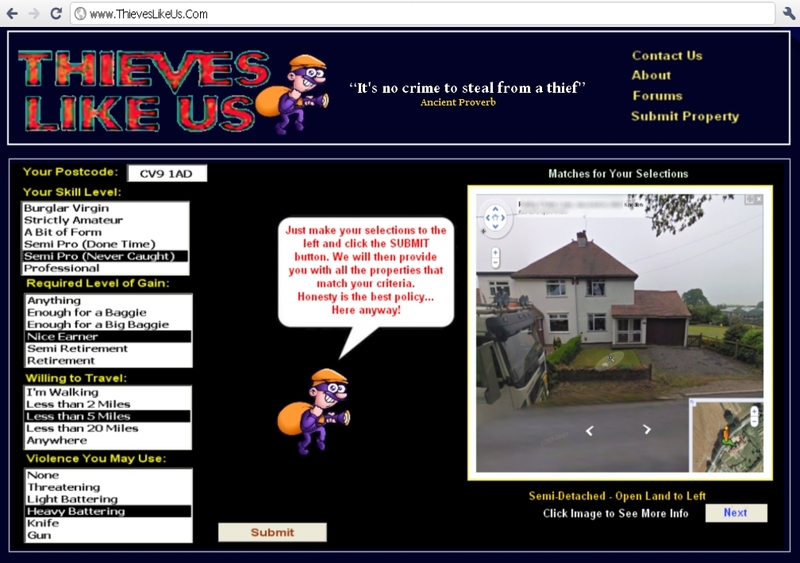 Utilising Google Maps, the website shows the frontage of the property and the rest of the information (ingress points, hazards etc) is supplied by users and displayed on subsequent screens. The 'target' properties are (supposedly) selected on the basis of a complex algorithm that searches the database of previously looted properties and matches them against your selected criteria and skill levels. The database of properties is, reportedly, constantly growing thanks to updates from users who have logged properties that they have either burgled or 'sized up'. The website also boasts a thriving and vibrant Forum where all manner of criminal activities are discussed, from burglary to shoplifting. It's all here. Thanks to advertising, the website is free to use. Sponsors include Aviva Home Insurance, Yale Locks and Chubb Security. We cannot see why anybody would want to use such a website, but if you are interested, check it out: www.thieveslikeus.com.